What an amazing time at Cedars... Let me explain. We are launching 19 groups this Sunday for all of you. We have so many people stepping into their gifting, or, at least are willing (with a little fear) to let God use them. We are so excited about this. Laura Haas has been working hard to make sure that these groups are successful. We are pretty sure there is a group that will help you where you are right now. And if you have not taken ROOTED this is a great time to do so. Download the Church Center App and log into Cedars Church. You will be able to see all the groups that are offered and sign up for them from the app. Or, you can go to the Cedars website to sign up as well. We want you to be equipped! Please take advantage of all that is being offered. Also, we are excited as we move into Holy Week: First, we will have a special service this coming Sunday that will highlight our Children's Program. We believe this will be the special service to help us move greatly towards Easter Sunday. Then, get this! Our Good Friday service is being led by our Home Church Pastors. It will be a special night. Each Home Church Pastor will take a segment of the service and then we will bring it all together with communion. This is a family experience, so no childcare for this service. Finally, it is Easter Sunday! We have life since our Lord and Savior rose from the dead and is alive. We will be looking at the power of an empty tomb. We will have our regular service times, but expect to be rather full. Be willing to get close to your neighbor. We believe there will be more room in the second service than in the first. Keep that in mind as you make Easter plans. Additionally, there are all these awesome things happening in background that we will be letting you know about in the weeks to come. We have been so blessed in this season. God is good and we keep seeing Him show up in some great ways. We may have as many as 5 people baptized at our next baptism service on May 5. If you have been thinking about baptism, this is a great time to get in touch with the church staff. Mexico signups have begun. This is always a significant trip. Do not miss out! We have a meeting right after 2nd service this Sunday for those interested. So go to the website and check under the Serve Tab for more information. Or, go to the Church Center app to check things out. 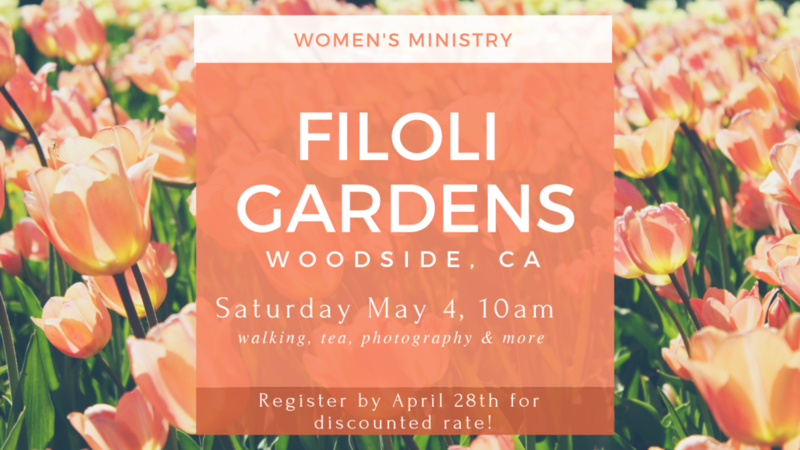 Finally the ladies have a trip coming up to Filoli Gardens! This could be something that you would really enjoy. Go to the Church Center App or our website for more information. Well there you have it. So much is going on, and we want you to be in the middle of it all. Come on, join a group, bring a friend to Easter services or go to Mexico. So many opportunities are before you. Older PostApril's Bulletin is here! Check out what is coming up!